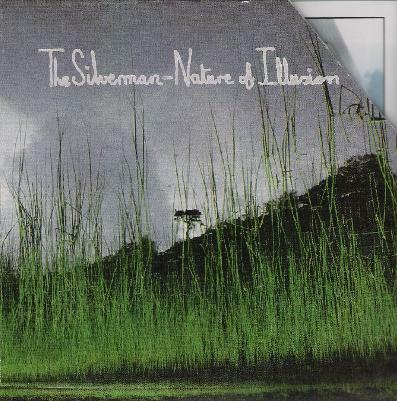 The Silverman - "Nature of Illusion"
The Silverman is Legendary Pink Dots keyboardist Phil Knight. Joining him on this record is the equally legendary Pink Dots front man Edward Ka-Spel. Nature of the Illusion is what I think of as the best kind of ambient music. Dark, swirling, and complex...it's as Eno defined it so many years ago: music that could just as easily be background music as it could be foreground music. Nature of the Illusion is interesting to listen to, if you should choose to do so, but works equally well floating in the background, barely heard, perhaps only by the subconscious. The album consists of two lengthy tracks, each in the 20+ minute range. The first, Nature of Illusion Part 1 begins with complex, brooding, ever-shifting and changing atmospherics. Out of it emerges a strange rhythmic structure as much created by The Silverman's percussive sounds as it is by Ka-Spel's chant like vocals, as it all floats along on dark, yet shimmering metallic waves, like a spectral and otherworldly ocean. Nature of Illusion Part 2 introduces slightly harsher drones, softened however by gentle melodic organ, taking the listener on a slowly relaxing voyage of intriguing sounds, in opposition to each other, yet still managing to work together. The first 700 copies of the CD also contain a bonus disc, which contains over an hour's worth of music in the form of one lengthy track entitled Woodland Calling. This one falls more into the kind of ambient music that is strictly background. A glistening oscillation that sounds something like a glass harmonica combined with a distant and primal horn drifts back and forth in minimalist fashion, changing ever so subtly and slowly as the piece evolves at a glacial pace. While it's difficult to just sit and listen to this whole piece (outside of, perhaps, the context of meditation), it does make for a unique kind of sonic environment, gently floating in the surroundings, with just enough edginess to elevate it above similar kinds of music that would more readily fall into the new age category. I don't know if all the copies with the bonus disc have sold out yet (you'd have to contact Beta-Lactum Records to find that out), but this album is nonetheless worth getting even without the second disc, as the Nature of Illusion tracks present some truly fine ambient music to tantalize your ears and your mind.